The posters appeared on the same day that Francis cemented his authority over the Knights by naming a top Vatican archbishop, Angelo Becciu, to be his special delegate to the ancient aristocratic order. Francis gave Becciu, the No. 2 in the Vatican secretariat of state, "all necessary powers" to help lay the groundwork for a new constitution for the order, lead the spiritual renewal of its professed knights and prepare for the election of a new grand master, expected in three months. The Vatican's intervention with the sovereign group had provided fuel for Francis' conservative critics, who until Saturday had largely confined their concern with his mercy-over-morals papacy to blogs, interviews and conferences. 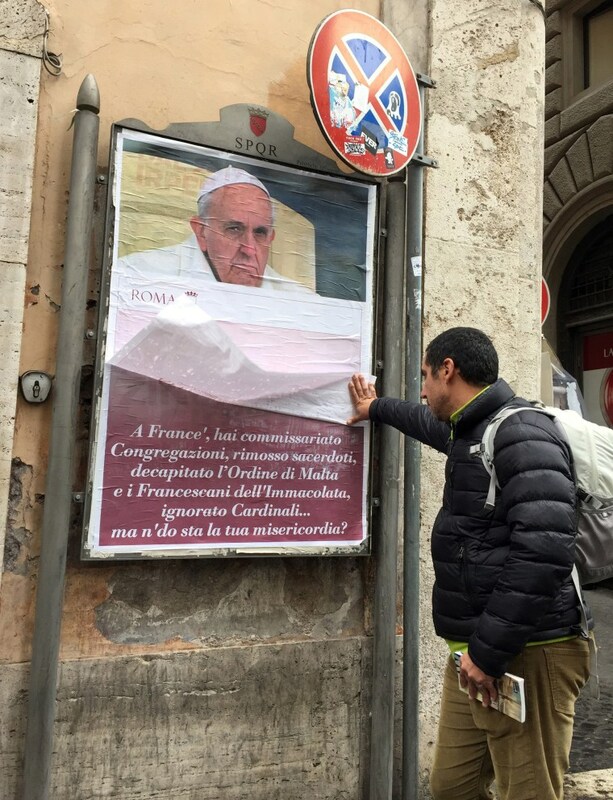 On Saturday, dozens of posters appeared around Rome featuring a stern-looking Francis and referencing the "decapitation" of the Knights and other actions Francis has taken against conservative, tradition-minded groups. Within hours, the city of Rome had plastered over the posters. Police launched an investigation into the conservative circles believed responsible, aided by closed-circuit cameras, the ANSA news agency said. The posters, written in Roman dialect, also cited the way Francis had "ignored cardinals," a reference to the four cardinals who have publicly asked Francis to clarify whether divorced and civilly remarried Catholics can receive Communion. Francis hasn't responded directly, though he has made it clear he favors case-by-case allowances. One of the four cardinals is Raymond Burke, a conservative American whom the pope removed as the Vatican's supreme court judge in 2014 and named to be his liaison with the Knights of Malta. Burke, a staunch defender of Catholic doctrine on sexual morals, has become Francis' most vocal critic and was instrumental in the Knights' saga. With Burke's support, the Knights' grand master Fra' Matthew Festing sacked the grand chancellor, Albert von Boeselager, over a condom scandal. After learning that the ouster had been done in his name, Francis effectively took over the order. He asked Festing to resign, restored Boeselager to his position, declared all the Knights' sovereign decisions on the matter "null and void" and appointed Becciu to help run the order temporarily. Becciu's mandate as the pope's "exclusive spokesman" with the order now confirms Burke's marginalization. In his letter Saturday, Francis said Becciu would work in "close collaboration" with the No. 2 official who technically is in charge at the Knights. The Knights are a unique organization. An aristocratic lay religious order that traces its history to the Crusades, the order runs a vast humanitarian organization around the world involving over 100,000 staff and volunteers. The order also enjoys sovereign status and has diplomatic relations with over 100 countries, the Holy See included.